As we explore the hacking and remixing of toys at the Making Learning Connected MOOC, I’ve been eyeing my sons’ toys around the house (they’ve been looking at me strange as I’ve been doing it, as if I were in another of our “let’s get rid of toys in order to get rid of clutter” mood). 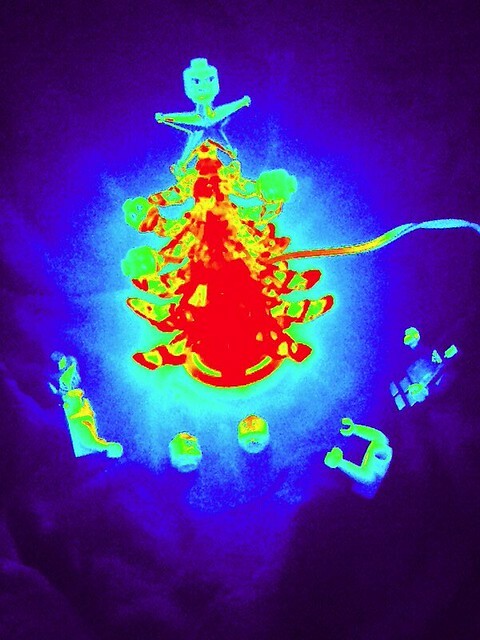 Sometimes, I’ve literally looked under foot. We have Legos everywhere, and if ever there is a remixable toy (other than Mr. Potato Head), it is a set of Legos. I didn’t want to just build something. That’s not necessarily hacking a toy, although I did experiment a bit with a multi-headed motorcycle-riding Lego man flying through the air (as I played around with some trick photography). No, in the spirit of the MOOC, I wanted to dive in a little different. The other day, I noticed something tucked away in the closet. If you are a teacher, you may get gifts now and then from students, Gifts you appreciate more for the thoughtfulness than for the usefulness. That’s what I saw. It is a little Christmas tree that lights up when you plug it into your computer via USB. I had never even tried it before, but now I saw my chance. What if I could mix the Legos with the Tree? What would that look like? Here is a shot of the scene before I turned on the tree. I put down a black t-shirt as the backdrop, which worked out nicely. Turns out, it looks pretty cool and eerie. 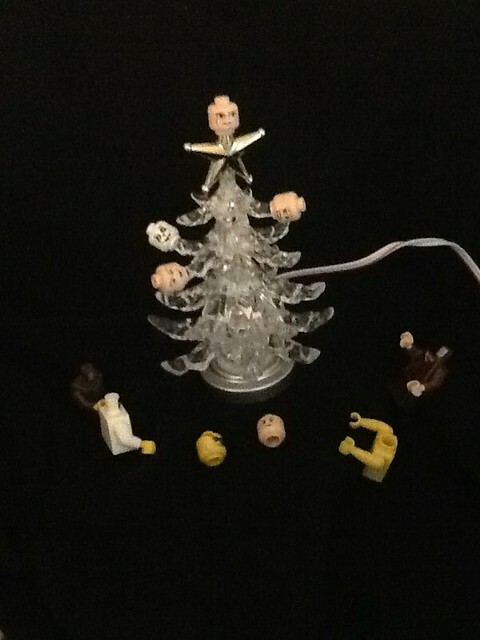 I decided to create a sort of Lego Prayer Scene around the tree, with Lego heads as ornaments and the headless bodies in rapt attention to the tree. At the very top, I put a stern-looking dude, as if he is wielding some sort of magical power on the heads and bodies below him. 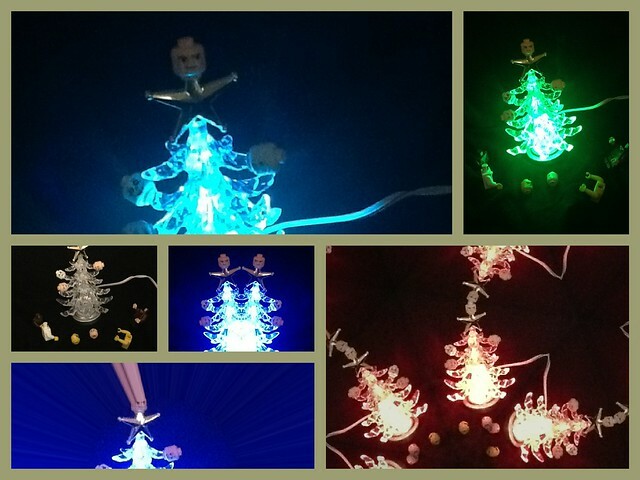 The tree turned out to be interesting, too, because it scrolls through different colors. The final step was using an app I have (Great Photo) to create a collage of the collection of photos, pulling them all together into one large image file. The result is an interesting mix, and makes me wonder about the possibility of telling a story with the image. I have an idea, but I’ll report back with that tomorrow. 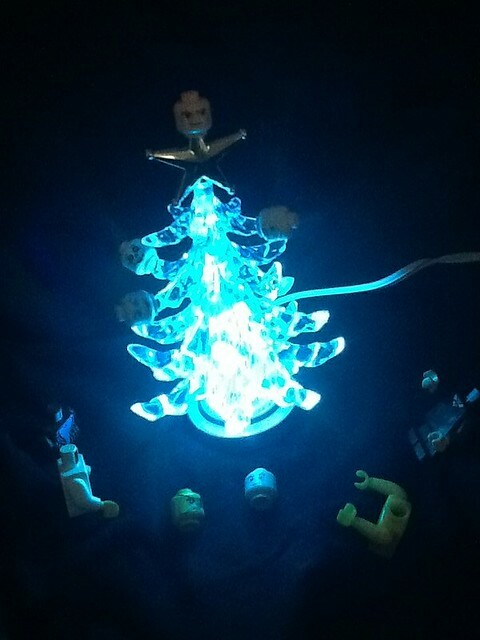 For now, enjoy the Lego Head Tree. I think your pictures tell the story. Their progression is a classic example of what David Gauntlett calls “everyday creativity’. And he doesn’t put that kind of creativity by calling it ‘everyday’. I love what all of these toys tells us about our blindspots. For example, I was reading about a toyhacking that really was about hacking something up–children’s books. Many participants had, at best, mixed feelings about cutting up their favorite children’s books. Why? The answer to that is what I mean by a blindspot and this case it was one that was exposed. Who knew that we are so resistant to remaking/remixing? Now we do and I think it is the classic case of one value system crashing into another. Thanks for the trainwreck, Kevin. I think that putting the lego people around it in prayer positions is pretty in line with “eerie.” Now I’m expecting either a political statement or a mini horror movie! I like how you just went with the flow. I really adore this — in photo and in words. Pure delight.